Properly caring for your dentures is the best way to ensure that they will last you a long time and continue to provide you with the best support. Similarly to your teeth, your dentures must be properly cleaned and maintained so they will remain strong and brightly colored. The first step to maintaining your dentures is to keep them as clean as possible. To accomplish this, you will want to rinse and brush your dentures daily. You will also want to rinse your dentures after you eat. Before brushing, you should rinse your dentures to remove any food particles that may have settled within them. Next you will want to brush your dentures to remove any plaque that has built up. Brushing your dentures daily is important because it will prevent food from adhering to the surface as well as prevent permanent stains from forming. In order to keep your dentures clean, you will want to make sure you use the right tools. For brushing your dentures, you will want to have a soft-bristled brush that is specifically designed to clean dentures. This is important because brushes that have harder bristles can cause damage or excess wear on your denture surfaces. You will also want to avoid using toothpaste and instead invest in a denture cleaner. Toothpaste, like brushes with hard bristles, can cause microscopic scratches from its abrasiveness. These scratches make it easier for food particles and plaque to build up, which can cause stains and excess bacteria. Instead you will want to use a denture cleaner because it is not abrasive and will clean your dentures without harming them. In a pinch, you can also utilize hand soap or mild dishwashing soap. There are also ultrasonic cleaners that can be used, although it is important to note that these cleaners do not replace brushing. In addition to keeping your dentures clean and tidy, you will also need to take special care to keep your mouth clean as well. If you have any remaining teeth, you will want to brush these teeth twice daily. Otherwise you can use gauze or a soft toothbrush to clean the soft tissues in your mouth including your tongue, cheeks, and roof of your mouth. You will also want to remove all denture adhesive. One final way of caring for your dentures is keeping them safe when they are not in your mouth. Dentures should be removed every night so that your gum tissue can have a break. 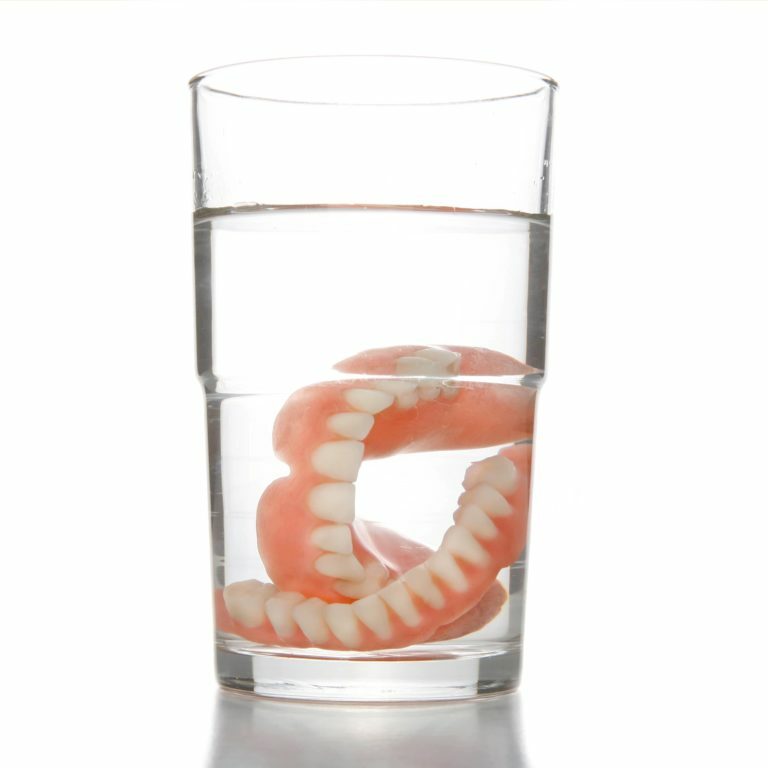 While they are not in your mouth, your dentures should be placed in a glass of cool water or denture cleaning solution so that they do not dry out. You should never soak your dentures in hot water, since this can cause their shape to warp, and you should also avoid cleaning solutions if your dentures have metal pieces, since this can cause the metal to tarnish. Finally, you will want to visit Dr. Simpson regularly, about every six months, to have your dentures examined to make sure they are working properly. Visiting Appletree Dentistry regularly reduces the changes of your dentures slipping or causing discomfort.